Glacier Pool Coolers is the global industry leader for cooling swimming pools. In almost 15 years, Glacier has become the #1 pool cooling system! Hot swimming water doesn't have to be a problem with Glacier's full line of coolers for residential, commercial and spa uses at the ready. Setting the standard with their energy efficient product line, Glacier is dedicated to providing pool owners an efficient, affordable, and economical line of swimming pool chillers. Glacier Pool Coolers' extensive product line can handle the smallest plunge pool/spa to the largest resorts & recreational facilities around the world. Spend more time enjoying your cool & refreshing pool all summer long with the original, trusted, patented swimming pool cooling system! Glacier pool coolers are the perfect remedy for uncomfortably warm pool water. Coolers are affordable, easy to install and inexpensive to operate, using an electric fan cooling system that requires no gas. They work seamlessly with your pool filter, taking cleaned water and creating a much more pleasant summertime swimming experience. No matter the size or shape of your pool, Glacier has a unit perfect for your needs. Not only will the pool be refreshing during the hot summer months but your water chemistry will be easier to maintain. A 10-degree drop in water temperature (from 95 to 85 degrees Fahrenheit, for instance) can result in a savings of 20-25% on chemical consumption because less water is lost to evaporation. Glacier coolers operate independently of a heat pump and are easily incorporated into your plumbing and automated control systems. They also cost pennies a day to operate, meaning you can handle the dog days of summer without dealing with the economical aftermath the rest of the year. They work by taking water from your pool's filter and chilling it with the airflow created by the cooler unit's fan. The chilled water is pumped back into the pool through the cooler's returns. This process works quickly, as well. Your pool water temperature can decrease from 10-15 degrees Fahrenheit in just 12 to 14 hours of use. (an important point to remember: If your pool has a pebble finish of any color or a quartz, tile, or dark-colored plaster bottom, this will slow the process somewhat since those surfaces absorb more thermal energy). 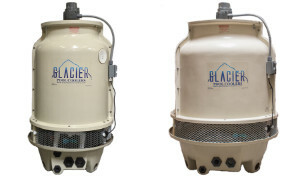 Glacier's coolers cover residential as well as commercial applications, and you can even cool your spa for hot summer days or medical purposes. One therapeutic swim in the heart of summer's swelter will prove that a Glacier is right for you.